How can you prevent people from rearranging your bulletin board? 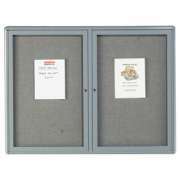 Keep your fliers just where you want them with glass enclosed bulletin boards and letter boards from Hertz Furniture. Efficient indoor signs prevent confusion and impress visitors by ensuring that directions, prices or event times are clear. Rather than having to direct confused or lost individuals personally, you can help them find their way with clear sign stands. 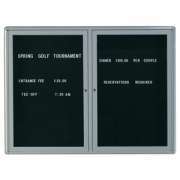 Where can you get tamper-proof bulletin boards? 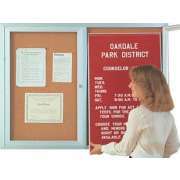 We have enclosed bulletin boards in a variety of sizes and styles so you can find the perfect configuration for the space that you have. Locking doors prevent unauthorized access and keep your fliers just where you left them. Keep congregants, students, parents and employees informed by placing updated information in clearly visible spaces. A lot of confusion and frustration can be avoided by providing clear information in a timely fashion. Even if your institution sends weekly newsletters and E-mails, people are likely to ignore or forget what they said. When you have all of the important announcements listed in a place that many people pass by on a daily basis, everyone will stay better informed so your administrative assistant doesn’t have to spend all day supplying basic information to people who neglected to read the newsletter. 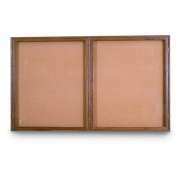 Where can I put an enclosed bulletin board? 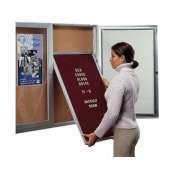 Our enclosed bulletin boards are great for schools, churches and community centers. They provide information in a clear and attractive way. 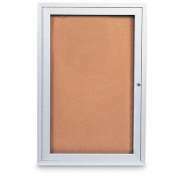 Locking shatterproof doors ensure that only authorized information is displayed and signs will not be tampered with. Students might be tempted to hang up campaign signs or information about outside events, but when the doors are locked, they will only be able to do so with official approval. No matter the size of your allotted wall space or message, we have a number of great options. Whether you want to put a board in the main hallway, office or teachers’ room, Hertz Furniture can help you find one that will fit the bill. We have boards that come with one, two or three doors so you can post everything from cafeteria menus to class lists to community announcements and much more. 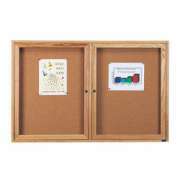 Once you have selected a size, the other main component to consider is whether you prefer a letterboard or corkboard. 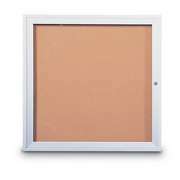 What are the benefits of enclosed cork boards? 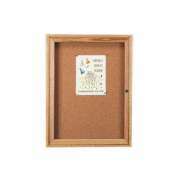 Enclosed cork boards are the more versatile option. With the simple push of a pin or staple, you can hang up posters and fliers for just about anything. On a bulletin board, graphics and text can be posted in any style or direction you choose. 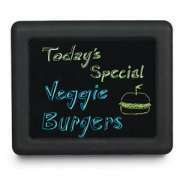 You can include logos and other pictures on signs in a variety of sizes and shapes. 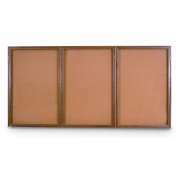 Bulletin boards come with either cork, fabric or vinyl surfaces. Self-healing cork is great because the holes that are created by pins will close up when the pins are taken out. If you don’t like the neutral brown of cork or want something a bit more exciting and professional, fabric and vinyl are both great options. They are available with different combinations of frame and board colors so they can be coordinated with wall or furniture hues. 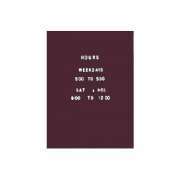 Should I get an enclosed bulletin board or a letter board? If organization, clarity and visibility are your main concerns, letter boards are the optimal choice. The clear lettering that comes with the board can be arranged to spell out any message that you want loud and clear. This is a great arrangement for a cafeteria menu or daily schedule which only needs to be modified slightly on a regular basis. Rather than having to waste paper and print out a whole new sign, you can get the information out there by simply changing around a few letters. 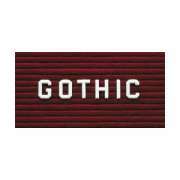 We have letters available in a number of different fonts so you can choose your ideal style, or mix and match. How can I get people to notice my bulletin board? Whether you choose a bulletin board or changeable letter board, having an eye-catching header can really enhance the display. Headers come with custom lettering, so you can choose to put on a school name or company logo. This arrangement makes it clear which organization or company the displayed information is coming from. With clear sponsorship, visitors and newcomers will easily know who to ask if they have questions. This extra feature is particularly helpful if a building is used for a number of different purposes or by various organizations. 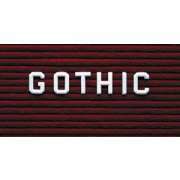 Looking for that little extra something to highlight your enclosed bulletin board and make it stand out? Built-in illumination puts the spotlight on your announcements and information, so passersby will take note of upcoming events and important updates. 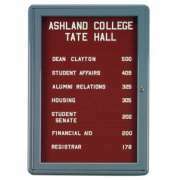 If the lighting in a hallway or lobby happens to be dim, an illuminated directory board will be easier to read, so people won’t have to strain their eyes to see the announcements. 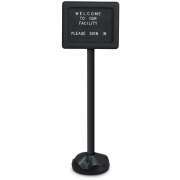 Pedestal signs are perfect for temporary purposes. They can be set up to direct visitors and guests to the auditorium, indicate where the line for reserved tickets begins or show the way to the snack bar. 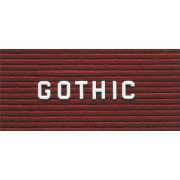 Sign frames can be used in conjunction with letterboards, printed signs or a chalkboard insert. The chalkboard option is super flexible. Even if you have to set it up at the last second, you can still provide clear directions. Presenting information clearly is the first step toward keeping everyone properly informed. With Hertz Furniture’s top-notch collection of bulletin boards, pedestal signs and message boards, you can choose the way you want to post announcements or menus. If you need help determining what the proper size or surface material is, contact the Hertz Project Solutions team for free project-planning advice.